The Luxurious and soothing Coco Oat Milk Bath in one 100 g / 3.53 oz bag. 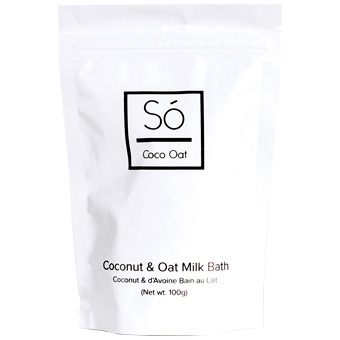 Só Luxury Coco Oat Milk Bath is natural and free of all nasties (toxins, parabens and carcinogens). It is made with 100% certified organic, food-grade ingredients. The combination of organic coconut milk and organic oatmeal gently cleanses baby's skin and enhances their natural baby softness without stripping the natural oils. Made in Mission, BC with 100% Certified Organic Ingredients.